EvE Marketeer is possibly the best EvE® Online marketing and statistics data web site ever created. 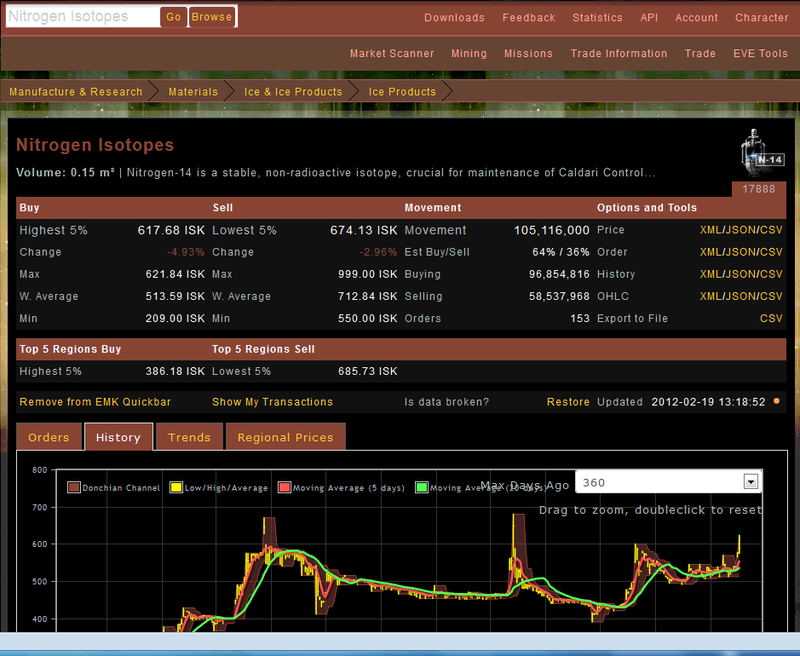 It features a seemingly endless amount of functionality, it’s really the tool for the serious EvE trader. – Unified data uploader to have the most updated pricing information sent to it and also the other prominent market web sites. It includes an in game browser web site where a trader may select what items to update, whether he wants to update orders or price history and then the software does everything. No need to do anything else, it’s fully automated and will switch market windows by itself! – Markets browser with search auto-completion where to look up the current prices and their history, along with an host of other statistics. The most used items sheets may be saved on a special quick list that may be selected with a click. – Loads of tools to find out about profits for certain activities, price indexes, hauling profits, missions profits, reprocessing tool and much more. – By providing an EvE® API key it’s possible to see your own wallet transactions, assets, industry jobs and much more. – Most of all – and this is what most pertains the web site you are reading on now – it has both copious ways to show graphs and to export their underlying market data. The developer of Vahrokh.com has worked closely with EvE Marketeer developer Callean Drevus to come as close as possible to trading industry standards. This includes the ability by EvE Marketeer to show candle bars graphs of the various markets and to export those markets in industry standard daily OHLC data comma delimited text files. The latter allows for direct import of such data in professional trading platforms like MultiCharts® Discretionary Trader. Swing traders who learned price action trading methods like those teached on this web site or on this EvE® forums thread will get a tangible advantage over the others.